Shopping for online for shoes, furniture or electronics is easy, but when it comes to perishable food, the distribution and packaging issues take on new complexity. Now a Swedish start-up has devised a solution for this in the iFoodbag, a paper-based bag that will keep food chilled or frozen for 24 hours. In development and testing for some time, latest news from iFoodbag is that it has signed a global production agreement with international packaging and paper group, Mondi, to enable this soution for easy online shopping for temperature-controlled goods. This innovative product, which has the potential to transform online grocery shopping, will now be available globally. 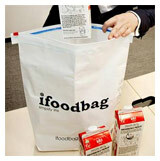 The iFoodbag, for which several patents are pending, is made from a revolutionary paper-based composite material. The result is a temperature-controlled packaging solution that can protect chilled and frozen goods for up to 24 hours, subject to certain temperature constraints and circumstances. Recent tests conducted, documented and verified by leading research institute, Innventia, have proven the iFoodbag’s unique benefits and its performance in keeping goods, such as foodstuffs and pharmaceuticals, chilled or frozen, says a company press release. “This innovative packaging product will be a genuine game-changer, as it will optimise and simplify the transport chain for temperature-controlled goods in new ways,” says iFoodbag’s founder and CEO Karl Fallgrens. “Food retailers who until now have struggled to offer an efficient logistical set-up for temperature-controlled home deliveries will be able to pack frozen and chilled goods in the iFoodbag and ship them in conventional vehicles instead of refrigerated trucks. “This will be added-value for online retailers as logistics and distribution costs will fall significantly. “We have thoroughly assessed several production partners during the last year to find a competent and forward-thinking company that will market this amazing product with us. “We are now happy to have signed an exclusive agreement with Mondi Industrial Bags. They are a leader within their industry, with production facilities all over the globe, while we have the leading and unrivalled technology for temperature-controlled goods. So we are a perfect match. This is a prerequisite for our global expansion roll-out during 2016,” he says.